St. Louis police shooting: Protesters subject to tear gas as car, building burn. 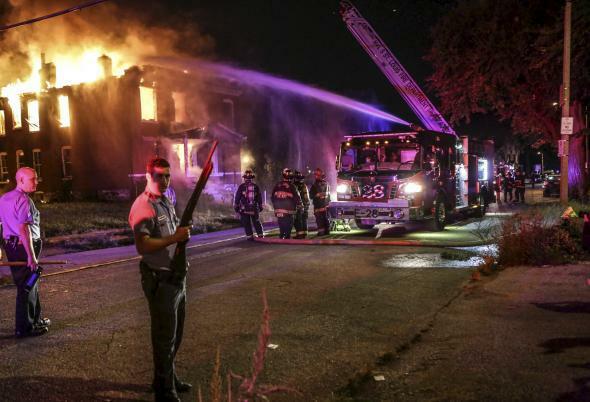 Firefighters attempt to put out a fire in an abandoned building that was apparently set during protests over the police shooting of an 18-year-old black man. Tear gas and fire made yet another appearance in St. Louis Thursday after an 18-year-old black man named Mansur Ball-Bey was killed by police, reports say. St. Louis city police officers allege that Ball-Bey was shot because pointed a stolen handgun at them while they were serving a warrant at a house at which crack cocaine and other illegal weapons were found. (Ferguson, the site of other recent protests, is outside the St. Louis city limits in St. Louis County.) Nine people were subsequently arrested on charges of impeding traffic during protests, and several fires were reported. By evening, police fired smoke canisters to break up crowds near the site of the shooting. Police closed off access to the area for a five block radius, with dozens of police vehicles congregated on Page Boulevard east of the site … Some of those who gathered to hear Police Chief Sam Dotson speak Wednesday afternoon grew angry at his account. As the crowd grew, so did the tension with officers, who arrived in large numbers. The incident took place one year to the day that a 25-year-old black man named Kajieme Powell was killed by St. Louis city officers while holding a knife outside a convenience store where he had been acting erratically.